They call it the ‘rugged, wild coast’ in Spanish. 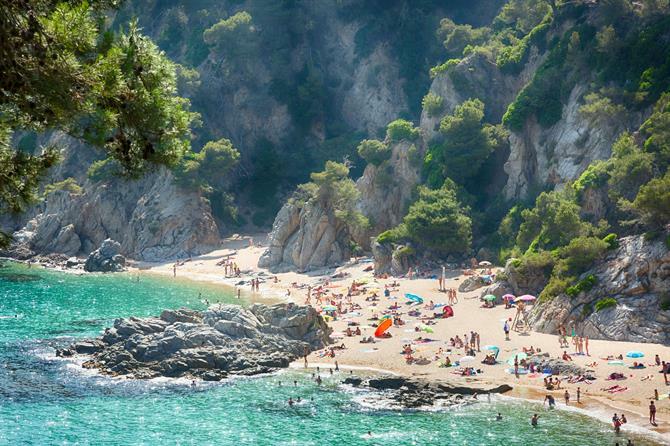 Whatever the meaning of its name, the Costa Brava is certainly spectacular. Come and discover the breathtaking beaches for your Costa Brava beach holidays. If you like beaches and nature, the Costa Brava will offer you a fantastic combination of both. Its pleasant Mediterranean climate makes it a popular holiday destination too but you can always find hidden beach coves with much fewer visitors. They are further away from the urban centres but totally worth the effort to get there. Below we reveal their secrets, what to expect and where exactly you can find them (see also map at the bottom). Sant Pol de Mar is one of the best-kept secrets on the Costa Brava. This beautiful bay with a unique dune landscape and shallow waters is ideal for families with children, especially as it has a play area for children in the Parque de las Dunas and a ‘Club Infantil’ or Children’s Club on the beach in the summer season. The beach is almost 1 km long and 25 metres wide and offers all kinds of facilities, including a nice promenade and watersports such as sailing, kayaking, windsurfing and water ski. 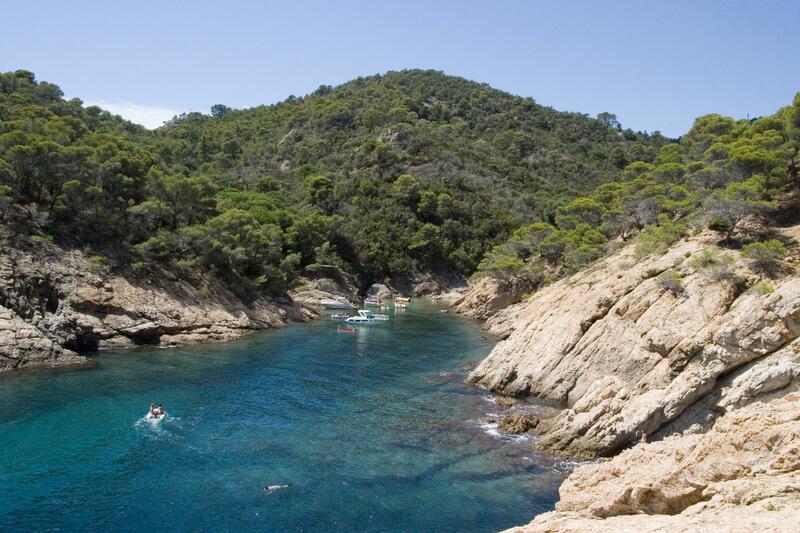 You can also explore nearby coves if you want to see colourful fish whilst snorkelling. With water this clear, no mask is required. 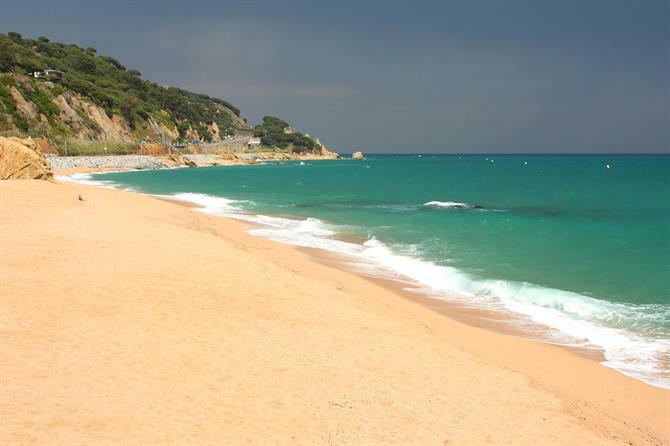 The charming former fishing village of Blanes is a recognised beach holiday destination. Blanes has both comfortable, long sandy beaches with all facilities and rocky coves which are renowned for their natural beauty. Cala Sant Francesc offers golden sand with calm water, beautifully surrounded by pine trees. This cute little beach is 220 metres long and 35 metres wide. The main facilities are present: showers, refreshments, sunbeds, pedalos, lifeguards, parking facilities and a restaurant, so it's a good place for families with children too. Cala Sant Francesc is also known as ‘Cala Bona’, which means 'pretty cove'. It’s two kilometres away from the centre of Blanes and close to the stunning botanical garden Marimurtra, so it’s great to combine a walk along the garden with this paradisiacal beach. There are several easy ways to access it. To walk there, just take the Passeig de Carles Faust street behind the port. Walk past the Jardín Botánico Marimurtra and continue along the same street for about 500 metres. 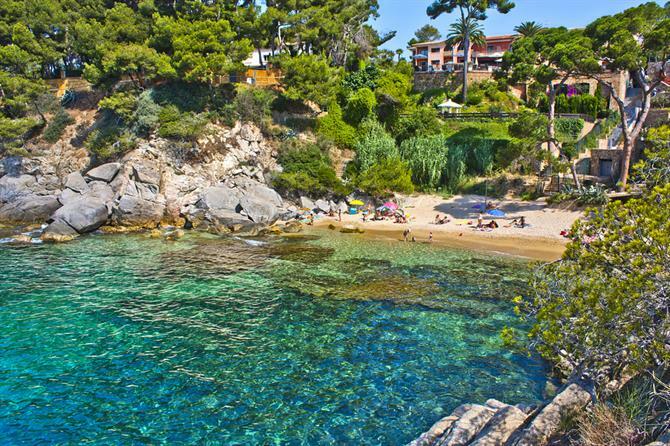 To get there by car, drive towards the beach resort of Lloret de Mar. About 100 metres before reaching the exit sign of Blanes, follow the sign 'Urbanització Cala Sant Francesc' and turn right. If there's no free parking space left, you can use the underground car park. Alternatively, you can go by bus. 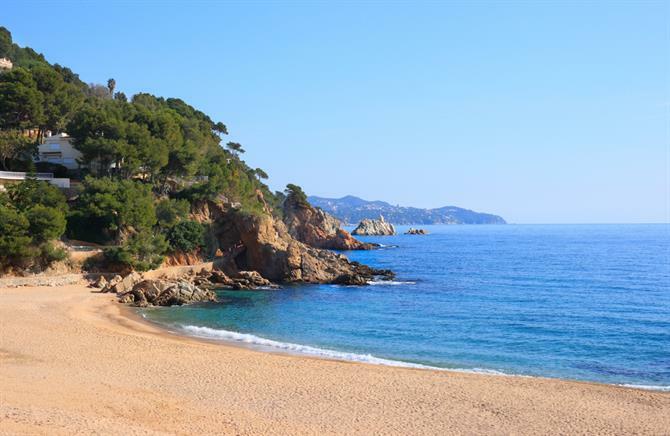 A mere 110 metres long and 15 metres wide, access this Sant Feliu de Guíxols cove on foot or by car as it lies right next to the great family resort of Lloret de Mar's main beach. Located in the Baix Empordà county, it will make you feel like you are in the Middle Ages as you look up to see a castle above this rocky inlet. Here you can enjoy the finest sand in a stunning natural setting. The rocky sides of this charming little beach are also perfect for snorkelling. 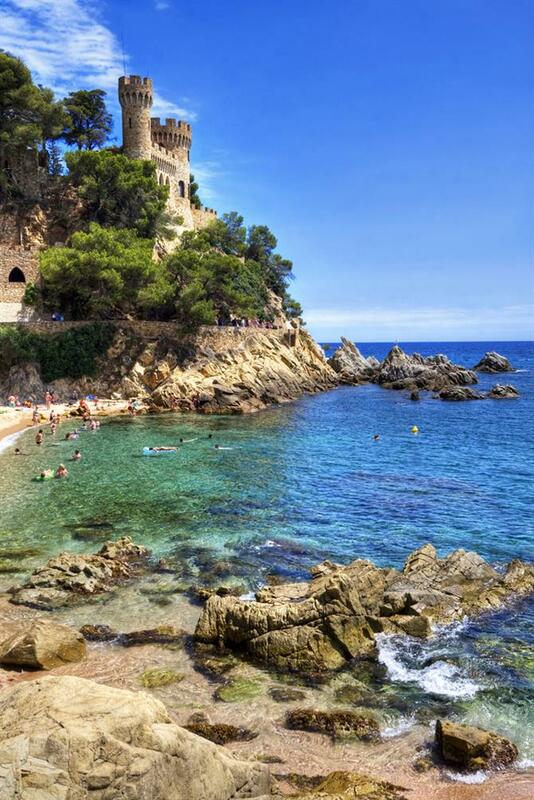 Tossa de Mar has some wonderful beaches on offer. About 5 kilometres north of the center you can enjoy this beautiful bay in the middle of nature, with inviting blue-green colours. It has golden yellow sand which is soft and fine to sunbathe on. Cala Giverola is about 170 metres long - the width ranges from 15 to 50 metres - and there are all kinds of services available for a pleasant day on the beach, including showers and sunbeds. There are also kayaks and boats for rent so you can enjoy these stunning surroundings from the sea. There is even a boat service (with a glass bottom) which takes you for a trip along the wonderful coastline. If you get hungry, try paella or fideuà in the restaurant with the terrace overlooking the Cala. There is also a beach bar or chiringuito. Don't forget your diving glasses and snorkelling equipment, and if you can bring your underwater camera! The water becomes deep quite fast and is perfect for swimming or diving. 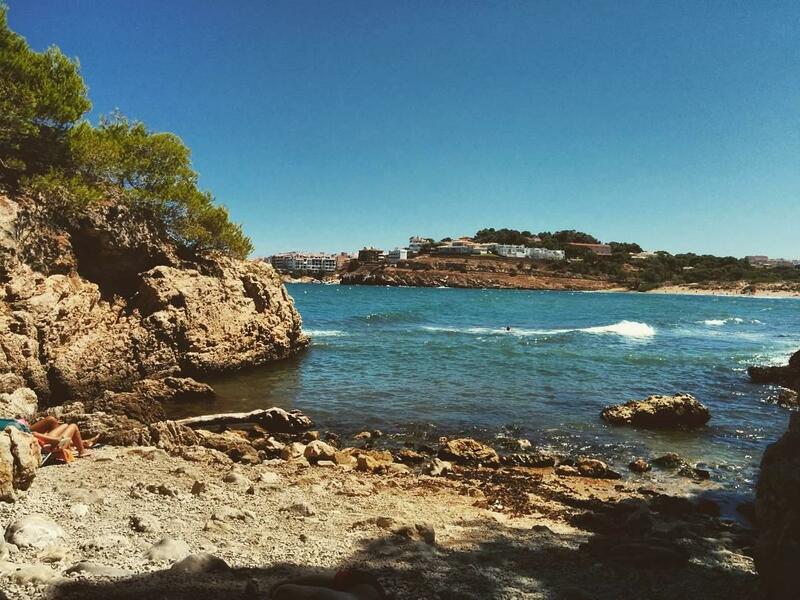 You can also climb the nearby mountain for amazing views over the Cala. This beach is easily accessible, as it is one of the best beach coves to go to by car. The beautiful town of Pola-Giverola is visible from the road between Tossa de Mar and Sant Feliu. There is a parking at this beach too. About 3 kilometres north of Tossa lies this cute little cove, well protected at the end of a narrow arm which runs both on land and in the sea. There is not much towel space on this tiny beach but it is made for swimming and snorkelling, as it is shielded from both winds and waves by long rocky walls. Its cristalline waters and its location between rocks and pine trees make it truly picturesque. The atmosphere is very nice in the summer, as it has a cozy chiringuito or beach bar, with views over the beach and the boats anchored in the bay. Cala Bona is best to get to by boat, but few of us have that possibility. You can walk there from the historical centre of Tossa de Mar. Or from the neighbouring Calas de Pola and Giverola (mentioned here above) to the north - a pleasant, relaxing 15-minute walk through the forest. 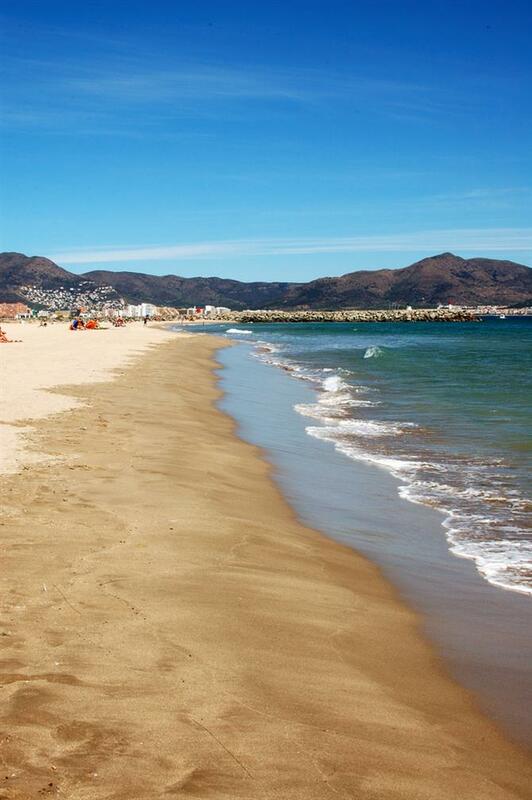 Enjoy more of the finest, golden sand at another of Platja d'Aro beaches. This one is bigger: about 650 metres long and 40 metres wide. Its idyllic setting is a comfortable drive from Girona airport. Access is easy and there are plenty of facilities for a relaxing day at the beach. With fine sand and transparent water surrounded by nature, this is Platja d'Aro at its most paradisal. You won’t find any beach bars or other facilities but you will be amazed by its beauty. The sand is golden and the beach is just 65 metres long and 15 metres wide. The mix of rocks and sand and even a rocky island on the right side which you can swim to, make this cove a favourite among snorkelers. Located in the extreme north of the municipality, you can reach this tucked-away cove by taking the road to Calonge. You don't necessarily need to go and find your picturesque beach cove in the middle of nowhere. 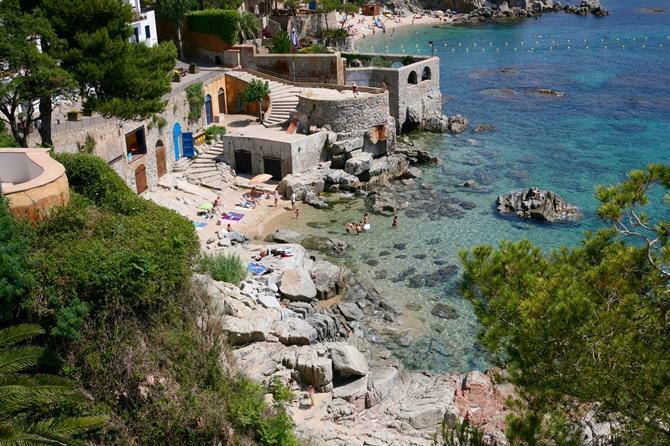 The charming coastal town of Calella de Palafrugell has several wonderful beaches, one of which is the little urban cove called Sant Roc or Els Canyers (in Catalan). This beach is only 40 metres long and dotted with numerous rocks, which doesn't make it easy to find the right spot for your towel. However, its crystal clear waters - perfect for snorkelling - and location make it a must see. To get there, you need to descend circular stairs from a viewpoint with an exceptional panoramic view of the bay of Calella. The old fishermen's porticos, where boats used to be stored when there was a storm, make this little beach cove all the more charming. Welcome to whitewashed Tamariu. Families love this unspoilt beach, as it has crystal-clear waters and plenty of facilities, including showers, a diving club, a sailing club, kayaks for rent and more. The beach is about 180 metres long and 40 metres wide and is surrounded by trees. If you don't fancy getting your feet wet or sandy, just sit back and enjoy the sea breeze at one of the beachside restaurants, where fresh fish is always the dish of the day. There is also a promenade for a lovely walk. Located just an hour from the historical town of Girona, you can reach it easily taking the A-7/E-15 motorway. 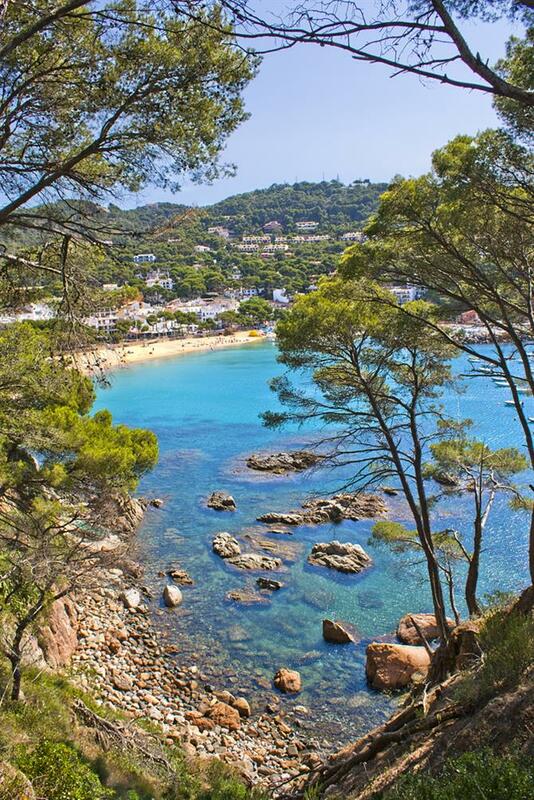 This quaint Begur beach is one of the most picturesque coves of the Costa Brava, with charming fishermen's houses and wonderful transparent, calm waters . The beach itself is a mere 80 metres long and 15 metres wide but has the main facilities such as public showers and a car park. Begur used to be nicknamed ‘Little Africa’ from the fact it is off the beaten track of the main Costa Brava. Still, it is only an hour north of Barcelona and one of the many beautiful places you can explore close to Barcelona. 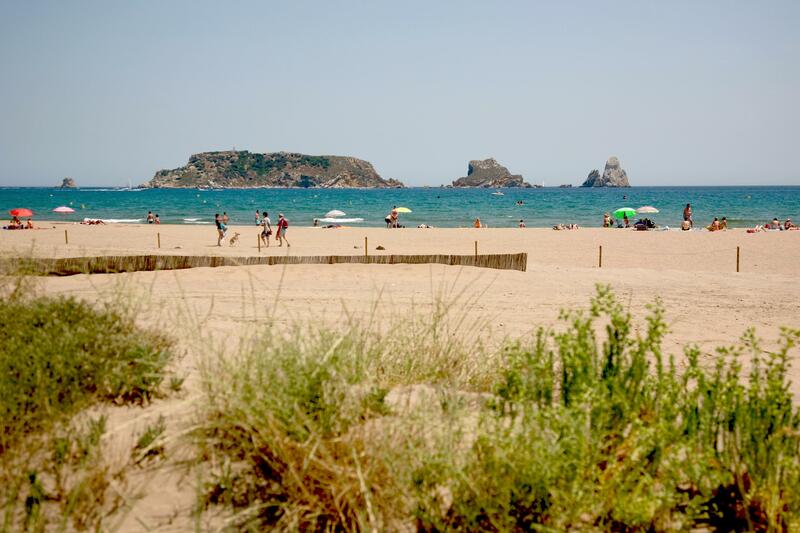 La Pletera beach is L'Estartit's hidden treasure. Thanks to its location inside the Ter Vell Nature Reserve and the fact that it is a bit more difficult to access, it is unknown to many and a secret haven for the lucky few who do know it. The pure air and natural beauty of La Pletera beach guarantee a day of complete relaxation. And if you get bored of lying on the beach, you can take a dive in the crystal clear water or try some (kite) surfing. If you don't mind leaving the city centre, you will be able to enjoy this fantastic beach, part of an environmental protection programme for the recovery of natural heritage. Other landscapes and natural landmarks that are part of this programme are the coastal dunes and the lakes and swamps of Baix Empordà. Apart from its luxurious sandy beaches, L'Estartit also has some cute rocky coves to discover. The curious Pedrigolet, a unique cove among the beaches in L'Escala, deserves a spot on this list purely because it is so well-hidden that you could spend a whole day there without anyone else showing up. It's like having your own private beach! 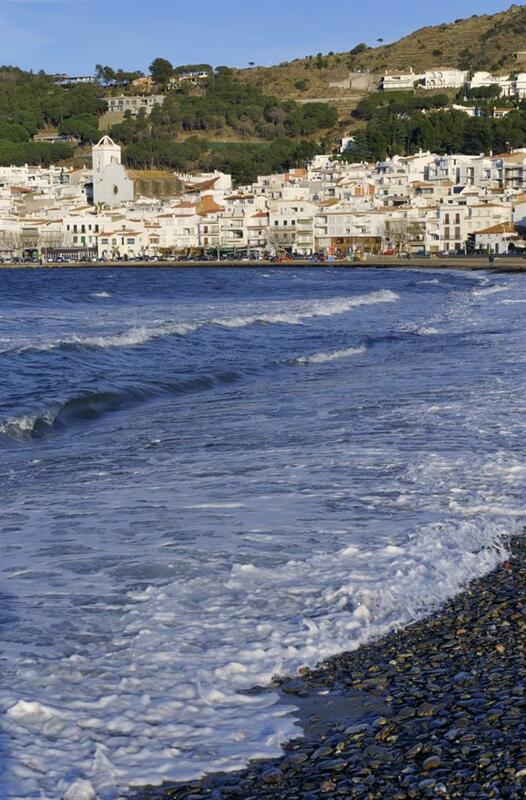 This tiny beach of pebbles and rocks (6 by 15 metres) is located between two bigger beaches, Rec del Molí and Portixol. However, you can only get there on foot by taking one of the pedestrian routes that start from viewpoints in the surrounding area. Pedrigolet is protected from north winds by a bay, making it perfect for snorkelling. Unlike most beaches in the area that offer a lot of services and activities, Pedrigolet is the place to be if you are looking for a private spot to wind down and relax. Watch the Blue Flag wave frantically about in the air on Costa Brava's widest, and quite possibly windiest, beach. This golden beach has all the facilities you could possibly hope for and is about 1575 metres long and 90 metres wide. Lay back and look at the beautiful view of the bay of Roses, including the imposing pair of Cap de Creus and Montgri Massif. There's a promenade which extends between Les Llaunes to the south and La Rubina to the north. As this sandy beach is easy to get to, with ample parking space, it is great for families. 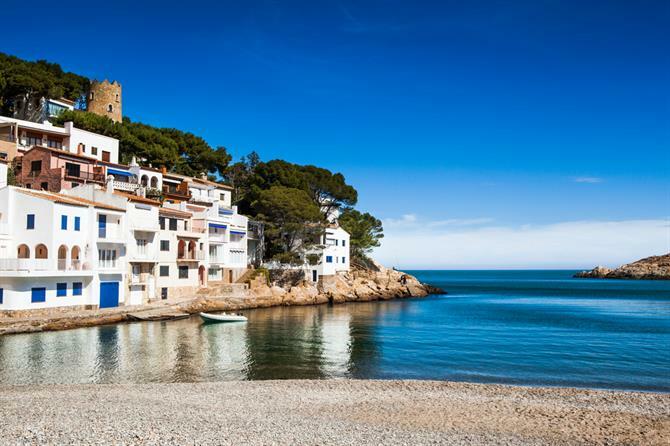 Travelling along the coast from Llafranc, the first beach you'll hit will be El Canadell. It is 200 metres long and 30 metres wide and is the largest of Calella de Palafrugell’s beaches. Marvel at the luxury beachside apartments and beautiful villas of the Costa Brava as you enjoy a gentle stroll along its promenade. The sandy El Canadell beach offers plenty of facilities within its colourful surroundings. You can easily get there by car or tourist bus and there is a car park nearby. Explore the picturesque landscape which inspired the great Spanish artist Salvador Dalí, whose Port Lligat house you can book to visit and is just a few bends along the coast away. The water is a beautiful turquoise, there are rock pools galore,... In short, Cap de Creus is the perfect bolthole. Spain's most easterly point puts the real into surreal. Once a fishing village, Port de la Selva has extended into a popular resort. It has, however, kept its charm with its whitewashed houses, a picturesque fishing port and spectacular views all around. Its main beach is a mixture of sand and pebbles and is popular with families as it offers all kinds of facilities, including watersports, disabled access and a car park just a few metres from the beach. 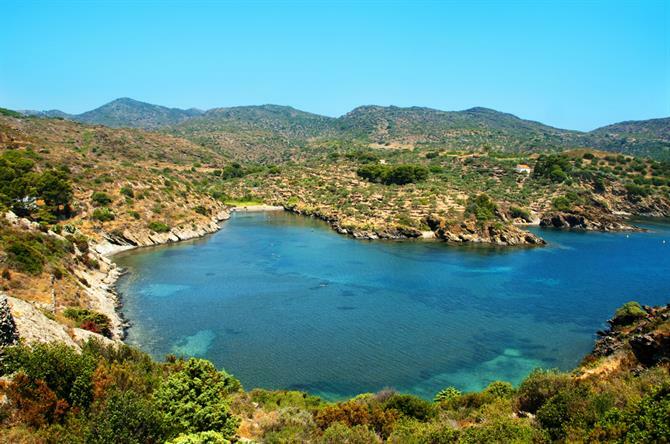 Take a boat tour to explore the nearby Cap de Creus or if you're feeling even more adventurous, how about jetskiing or parasailing? 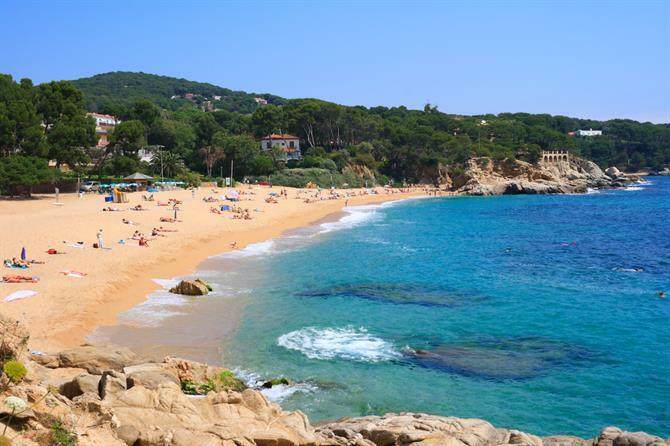 Close to Figueres, to the north of the province of Girona and just a step away from the French border, you can discover some real pearls of the Costa Brava. Cala del Pi is a lovely little cove surrounded by cliffs and with a fascinating contrast of dark pebbles and crystal clear waters. Known for its intimate and relaxed atmosphere, it is a fantastic refuge for nudists and nature lovers. It is also the perfect spot for scuba diving and snorkelling. This tiny oasis is only 500 metres away from the main beach in Portbou. You get there following the coastal track of the Camí de Ronda. Sounds easy? Yes, but wear sensible footwear, as there are some tricky sections along the way. Don't go when there are strong winds. You will cross the also very nice Tres Platgetes on the way, but do continue to Cala del Pi as well. It is worth it! 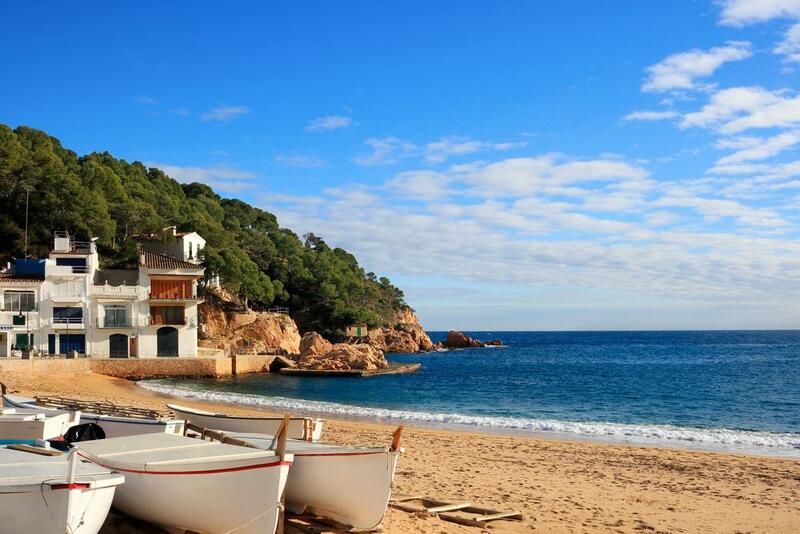 With so many treasures hidden along the Costa Brava coast, it is a destination you won't regret choosing!